The ring is considered a premarital gift and it remains with the wife upon the dissolution of the marriage as in Greenberg v. Greenberg, 698 S.2d 938 (Fla. App. 1997)). 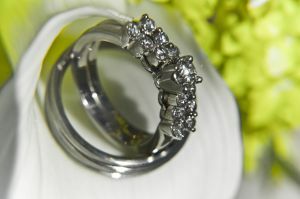 The value of the ring, given that it is premarital, does not go into the pot of the value of the couple’s assets. The ring is not considered part of the assets that are equitably divided per Florida law regarding marital assets. For those with an engagement ring that was a family heirloom, the same ruling applies because the ring is considered a premarital gift regardless of its origin. However, if you intend otherwise, then that premarital agreement should be put in writing to assure the return of the ring if that is the desire of both parties at the time the ring is given.